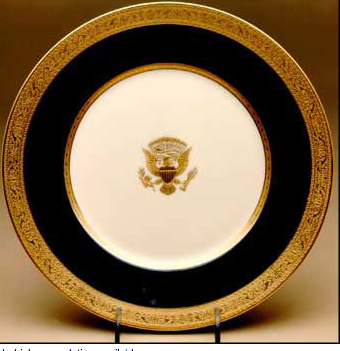 Editor’s note: The Obamas chose Lenox china from the White House’s historic china collection to set the tables for their first state dinner on November 24, 2009. The china the Obamas selected was from the Clinton and second Bush Administration. LENOX PICKED BY 6 PRESIDENTS--Between 1918 and the present, six presidents have commissioned Lenox to issue new state services, each reflecting both period tastes and the timeless beauty of Lenox's renowned ivory china. "We are dependent upon foreign factories for the very dishes from which the Chief Executive of the United States must eat," thundered President Theodore Roosevelt in exasperation at the lack of quality American china in the early 20th century. 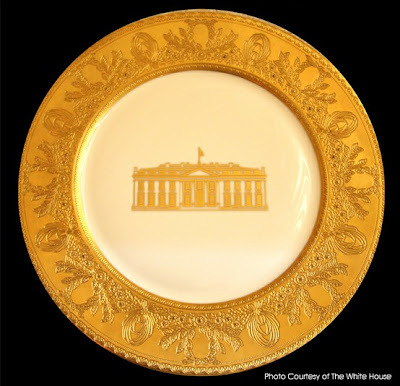 Even though Congress had decreed in 1826 that all furnishings purchased for the White House be manufactured in the United States, no president had ever deemed domestic porcelain worthy of the State Dining Room. Little wonder. Until the Roosevelt administration, no American pottery had dared compete with the prestigious porcelains imported from China, England, and France. Consequently, first families from the Washingtons to the Tafts dined and entertained using tablewares, tea sets, and dessert services that had been produced abroad, even if the designs had been developed or the decoration applied in the United States. Walter Scott Lenox changed that. In his determination to devise the perfect porcelain, the ambitious potter created wares that were indeed fit for presidents, and Lenox became the first American china to be used in the White House. When President Woodrow Wilson, and his wife, Edith, arrived at the White House in 1913, the "newest" china was already 10 years old, having been ordered by Theodore Roosevelt from an English pottery. Even though pieces had been replaced through the years, a complete new service was needed by 1918. Mrs. Wilson, like first ladies before her, hoped to purchase an American china. Upon visiting Dulin & Martin Co. — a fashionable shop in Washington, D.C. — to view a display of Lenox china, she was so impressed that she asked the store to obtain designs from the pottery. The pattern developed by Lenox's chief designer, Frank Holmes, was as restrained and dignified as the Wilsons themselves. It features a deep ivory border surrounding a brighter ivory body and two bands of matte gold encrusted with stars, stripes, and other motifs. Each of the 1,700 pieces also bears the presidential seal in raised gold. The service was delivered to the White House between August and November 1918. After the first shipment, Mrs. Wilson brought chocolates to the Trenton factory employees to convey the family's appreciation. Wrote one New York newspaper, "The proud day has arrived when the White House dining service [was] designed by an American artist, made at an American pottery ... and decorated by American workmen." Durable and popular, the Wilson china remained in use during the administrations of Presidents Harding, Coolidge, and Hoover. Because of the bleak economic picture when President Franklin D. Roosevelt took office in 1933, no replacement china had been ordered for a year and a half, and the service was nearly depleted. First Lady Eleanor Roosevelt championed the need for new china, stating that it would keep American workers employed. The Roosevelts ordered 1,722 pieces of Lenox china through a New York store in October 1934. The design was suitably patriotic, bearing a border of 48 gold stars — one for every state — and the presidential seal in enamel colors on a lustrous ivory body. But it was also personal to the Roosevelts. The stars glimmer against a band of marine blue, inspired by the president's interest in all things nautical, and are complemented by a scroll-like inner band of gold roses and feathers, motifs adapted from the Roosevelt family crest. The Lenox factory worked overtime, reported the media, so that the china would be ready for an important state dinner in January 1935, one of the largest affairs ever held in the White House to date. For the first time, every guest dined from a single service — from first-course oysters to after-dinner coffee. President Harry Truman and his wife, Bess, presided over a major renovation of the White House between 1948 and 1952. The State Dining Room, which had been paneled in oak in the early 20th century, was painted a soft celadon green, and the Trumans wanted a new service to coordinate with the décor. Working with the New York department store B. Altman and Company, which was managing the interior decoration, the Trumans ordered 1,572 pieces of Lenox china in 1951. The pattern includes a border of celadon green flanked by an etched gold band and a 24 karat gold rim on an ivory body. Perhaps the most significant feature of the Truman service is its raised gold presidential seal, which is surrounded by 48 gold stars. Concerned about the varying design of the insignia over the years, the president issued an executive order in 1945 to standardize the seal. The china reflects that order, with the head of the eagle turned toward the olive branch of peace clutched in its left talons, instead of toward the arrows of war at the right. The service debuted on April 3, 1952, at a luncheon for the Dutch royal family. The Trumans, who had lived in the nearby Blair House during the renovation, had moved back to the White House just a week before. Thirty years after the Trumans had ordered their china, state dinners became so large that none of the White House china could accommodate the number of guests. President Ronald Reagan and his wife, Nancy, turned to Lenox in 1981 to provide 4,370 pieces, enough placesettings of 19 pieces for 220 people — nearly twice as many as other recent services. The first family was accustomed to formal entertaining and chose a pattern to reflect their tastes. Also, in the intervening years since the White House renovation of the early 1950s, the State Dining Room had been painted white, so the Reagans wanted a china with a strong presence for the large, subtly colored room. Mrs. Reagan worked closely with Lenox designers to develop a pattern with bands in a striking scarlet — her favorite color. The bands vary in width depending on the scale of the piece and are framed on each side with etched gold, creating a sparkling contrast with the soft ivory china. The presidential seal, in raised gold, partially overlays the red border. On certain pieces, such as the service and dessert plates, fine gold crosshatching overlays the red — a decorative technique that required extensive special handling and nine separate firings in the kilns. The Clinton service is remarkable not only for its revolutionary design but also for its significance to the history of the American presidency. The Clinton administration coincided with the bicentennial of the White House as home to America's first families, a role it had played since John Adams, the second president, took up residence there on November 1, 1800. To commemorate this event, and also replenish the stock of official state china for the first time in nearly two decades, President William Clinton and his wife, Hillary, commissioned Lenox to create 300 12-piece placesettings in 2000. 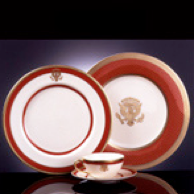 In a dramatic departure from previous White House services, the Clinton china features a border of pale creamy yellow, instead of a bright primary color, and images of the White House facades, in place of the customary presidential seal. Each piece in the placesetting is decorated with a different pattern, the motifs derived from outstanding architectural elements found in the State Dining Room, East Room, and Diplomatic Reception Room. Fittingly, the china was used for the first time at a dinner attended by former Presidents Gerald Ford, Jimmy Carter, and George Bush, their wives, and Lady Bird Johnson, former first lady. The most recent acquisitions to the White House collection, made during President George W. Bush's term, were in the works for several years. These acquisitions included a Lenox china state service for 320 people. First Lady Laura Bush chose Lenox, in part, because it is an American company. She consulted with the White House floral designer, Nancy Clarke, to determine a color style that would be different from the red Reagan Lenox china, from the yellow Clinton Lenox china. They chose green because it works with any flowers and with any season. The set was designed to be used for large dinners in both the State Dining Room and in the East Room. 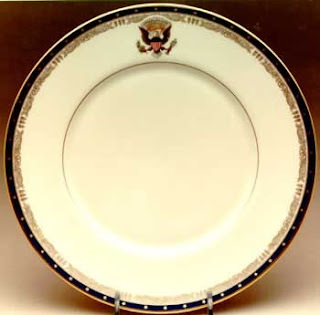 The chargers bear the seal: "The White House 2008 Lenox, made in the U.S.A."
The Bush administration used all of the White House china services — all the time. Upstairs in the dining room, which is the presidential residence, the Bushes used the Reagan china — the same china used for State Dinners — for lunch, small family dinners and other occasions. Mrs. Bush noted that the new china would be used by the next First Family and those to follow. "I'm very, very grateful to have had... the Reagan china, and the Clinton china, to be able to use for entertaining here," she said. Funding for the new china was provided through the privately funded White House Historical Association, the White House Endowment Trust, or the White House Historical Trust.